OAKLAND, Calif. — Dirk Nowitzki added one more memorable game in his final visit to Oracle Arena, scoring a season-high 21 points and insisting he couldn't remember whether it was a chair or a trash can that he threw into a wall opposite the visitors' locker room at one of his favourite arenas. 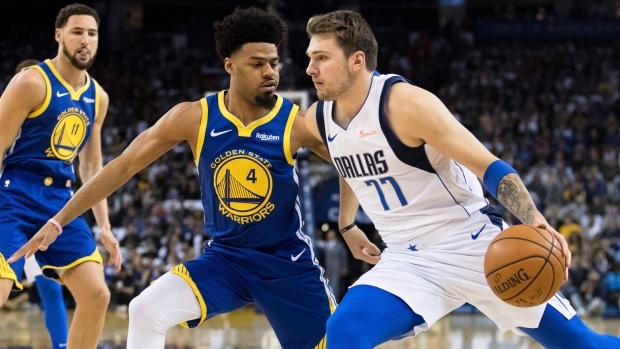 Mavericks: Doncic had his sixth triple-double of a stellar rookie season. ... Nowitzki went 8 for 14 from the field, including 5 of 8 on 3-pointers. ... Mavs hit 65.2 per cent of their shots in the first half, while holding the Warriors to 29.6 per cent. ... Maxi Kleber had 16 points and Ryan Broekhoff added 17 off the bench for Dallas, which snapped a three-game losing streak. Warriors: The four 3-pointers made tied a season low. ... Missed seven of their first eight shots and never really recovered, shooting 40 per cent for the game. ... Andrew Bogut, who recently re-signed with the Warriors, also skipped the game for rest. ... Quinn Cook, who took Curry's place in the lineup, led the Warriors with seven assists.